Pick a book, any book, from 70,000 choices. If you’re like me and you’ve got a fancy Kindle Fire HD, or like a lot of other people and you own something like a Kindle Paperwhite, buying books has become something of a challenge. Not that Amazon’s interface makes it hard to sell books–if anything, it’s too easy–but you’ve got to make a choice. Do you buy a Kindle version and save some shelf space, buy a used paper version that might be the same price as the Kindle version, or buy a new version and spare yourself the risk of pinkeye from handling someone else’s toilet reading? Now, Amazon is making that choice a little easier, and giving you a chance to reread some of your old favorites. Amazon’s Kindle Matchbook allows you to buy a low-cost or free version of a book you’ve previously bought new from Amazon. Think of it as a version of Amazon AutoRip for books. Of course, if you’re not a person who tends to read books multiple times, I doubt this will have any appeal to you. However, if you’re a packrat looking to shed a library of leftovers, or if you’re the kind of person who buys special-edition DVDs/Blu-rays, then I can see how this would be appealing. Personally, I’d rather spend $10 on a new book, then sell the book after I’ve read it while keeping the option to pick up the e-book version of the thing later. Seems like a better option than spending $10 on a Kindle book that has no resale value, or keeping a physical book around after I’ve finished it (and may never read again). 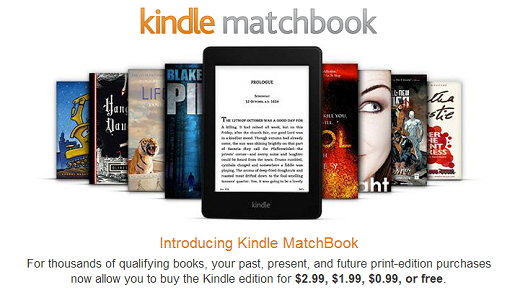 If you’re curious if any of your recent purchases qualify, check out Amazon’s Kindle Matchbook finder and see. There are currently 70,000 books available, with more on the way.